Tanner De Witt was pleased to be invited to participate in The St Andrew’s Society Scholarship Fundraising Golf Championship at Mission Hills in China on Friday 28th August. After an early start Russell Bennett and Anthony Hill took to the fairway in Shenzhen to compete in this 120 participant tournament, open to all amateurs, Mission Hills members and guests. The day began with a 11:30am Shotgun Start and participants covered an 18 hole course. The best three stableford scores would be counted as team scores and the team with the highest scores wins the game. Unfortunately we didn’t win any competition prizes on the day but Russell was thrilled to win a stylish and practical handbag in the charity auction which Ian De Witt also attended. Funds raised will be transferred to the Youth Development Fund and used to send outstanding young local golfers to the University of St Andrews, the “Home of Golf”, to pursue further studies. 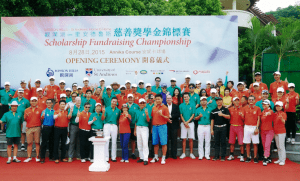 The “Mission Hills – St Andrews Home to Home Scholarship Fundraising Championship ” was jointly established by St. Andrews University and Mission Hills in 2013, on the occasion of the 600th anniversary of St. Andrews University and the 20th anniversary of Mission Hills Golf Club. 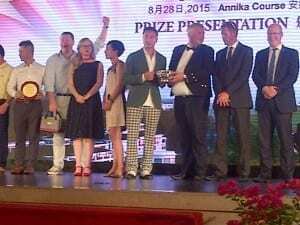 The former is where golf originated – the “Home of Golf”, while the latter is a golf pioneer in China. The tournament is set to carve a niche in golf’s history as an exceptional charity golf event. For further enquiries about community activities at Tanner De Witt, please contact us.